The Server instances from which the user can choose are defined in the WWSettings.xml file that is installed on the system on which the user is working. 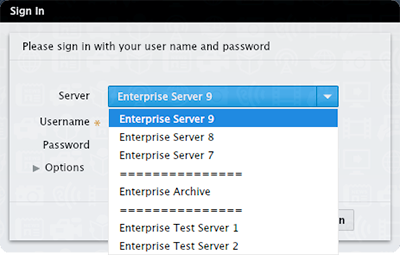 The Enterprise Server instances are added to the list by defining them between the <SCEnt:Servers> </SCEnt:Servers> tags. Note: This list is used by all applications that can log in to Enterprise and may therefore include settings for these applications.